Mythic Invitational Happening Now: The event runs March 28-31, so it has started. Depending on when you read this, it may even have ended. Congrats, someone! Coverage is on Twitch.tv/Magic. Another Last Minute Roster Change: Owen Turtenwald will not be playing in the Mythic Invitational. Wizards has not said why. He was replaced by Brian David Marshall, which was great. MTG Arena Staying PC Only: Wizards has announced that MTG Arena will not, for the foreseeable future, be ported to other platforms. No Macs. No Android. No phones. Wizards had said they were building the program on a framework that was easily transportable to other platforms. 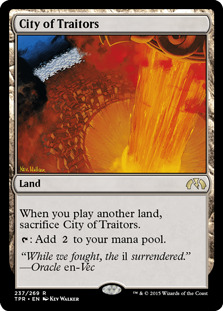 They said that about earlier versions of MTGO as well. Remember Silverlight? Apparently porting is difficult, like always. In a few hours, as I write this, the coverage of the Mythic Invitational will commence. We will see what Wizards has created for their big eSports debut for MTG Arena. Here’s hoping we will see some serious innovation above and beyond the Pro Tour coverage we have seen at the last few events. At the very least, Wizards could repaint the desks. One improvement we have heard already – Wizards will be running the twitch.tv extension that shows decklists. That extension was developed by Cardboard.Live. It should allow viewer to pop up both decklists (it’s dual Standard) for both players. The cardboard live plug in has been used by SCG events, and by a number of streamers. The cardboard live plug-in is a nifty new innovation. So is streaming coverage, for that matter. Coverage has changed a lot since I started watching. Technically, since I started reading coverage. I started paying attention to tournament Magic twenty years ago. That was a long time ago, both in terms of Magic and in terms of the Web. The world wide web was invented in 1991, but even in 1998, what Magic coverage that existed was still mainly message boards and email lists – and most of that was ASCII text in courier font. By 1998, we had one website – The Dojo – that published Magic content. I wrote for it, as did several pros of the time. Many others submitted articles and tournament reports. Back then, tournament reports on The Dojo were the best way to get information, and even decklists. Tournament reports generally started with “so we drove to the event..”, but then moved on to a match by match recap. The good ones talked about what was important in each matchup, and how the player sideboarded. 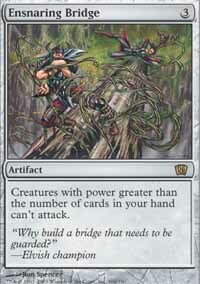 Back then, Wizards published an actual, printed with glossy ink on dead trees magazine, called The Sideboard. It also contained some decklists and articles, but they were hardly current. The Sidebaord was a monthly magazine, so everything in it was at least two months old, by the time it appeared, physically, in your mailbox, or on the racks in your local game store. That changed when Wizards turned the sideboard into a website. At that point, text coverage of a major event, like a Pro Tour, went up later that same day. Coverage reporters sat next to matches, taking notes. At first, those notes were taken with pen and paper. Laptops came later. I remember back when one of the challenges the judges in charge of logistics faced was getting power to the feature match areas, because laptops of the day did not have anywhere close to enough battery life for a whole event. Eventually, Wizards started streaming events. They adopted the techniques Rashad Miller and his ggslive team developed for the SCG Open Series – and they also hired Rashad and the ggslive crew. Early on, video coverage consisted of mounting a video camera on a pole above the feature match table. Over time, that evolved into multiple cameras, an awning to cut glare, and so forth. After a couple years, Wizards had professional videographers, boom mounted cameras and a full control room to handle switching. 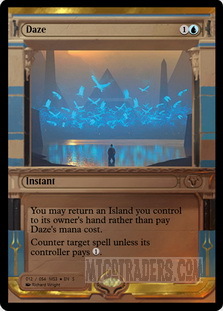 Over time, Wizards also developed methods of getting card images on the screen during coverage. One early method was “push tool.” Push tool put an image of a card on the screen to the side of the screen. To make it work, someone had to type the name of the card into a box, then click post. The problem was that the push tool guy was back in the control room, looking at the video feed. Since the video was going out to the public feed was delayed by five to ten seconds, you could listen to the commentators, then try to time the push tool to get the card up just as it became relevant to the play. Timing was tricky, but it was doable if you were careful. I was the push tool guy at several World Championships, and close to a dozen Pro Tours. It was a great job – I got to watch the coverage of the Sunday play. But that was all. Back int the day, the coverage for the earlier days was all written. Video was only on Sundays. A quick story. I don’t know for sure that this is true, but I heard that I got the job because of a mistake the previous push tool guy made. Wizards had been using judges to run push tool, because they were already at the event, and Wizards needed fewer judges on Sunday. 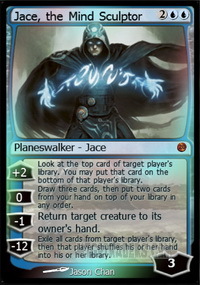 So they were using a very good judge, but not one who played a lot of tournament Magic. 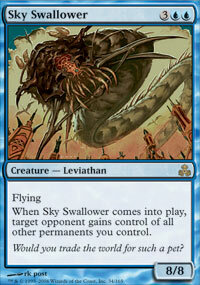 So when coverage talked about how important “Sky Swallower” was in the match, that judge pushed an image of Sky Swallower. Here are some images. Which one do you think was seeing play in a Standard Pro Tour Top 8, and which one do you think got pushed – several times? After that, I got the job, because I was writing a ton of articles breaking down the metagame. I knew what was playable, what was being played, and what wasn’t. I loved doing push tool. Over time, though, that job was moved into the control room, and automated. But it was fun while it lasted. Over time, the set has evolved. 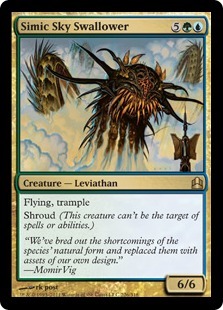 I remember, at Worlds in 2004, that Wizards had giant Moxen hanging on sculptured supports that were probably 10 feet high. They were big, clunky and needed repainting. They disappeared a few years later. At Worlds in Paris, a few years later, Wizards had a giant Serra Angel. The set, in those days, was pretty simple. A lot of the event including feature matches and some coverage, was done on convention center folding tables covered with black tablecloths. That evolved, too. Recent Pro Tours have had dedicated, transportable sets for the coverage staff. It got better and better – for a while. I am home from work, now, and have had a chance to watch parts of the first day of Mythic Invitational coverage. Wizards has put some effort into this. The set looks good – the more so considering that the amount of square footage Wizards has in its PAX East booth is limited. Coverage seems to be flowing pretty well. I have been involved with live TV events for over 30 years, and it looks pretty good to my eye. The main problems have been delays when players were not ready to walk on stage. That should be fixed tomorrow. Other than that, the cameras work, none of the Arena sessions have crashed, and the pyrotechnics haven’t set anything on fire where anyone can see it. That makes it a good day one. 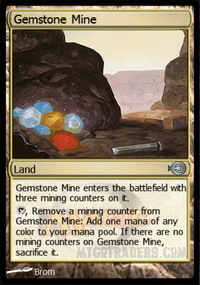 Standard: GP Kyoto brought us a slightly different metagame. The Top 8 was 3 Sultai Aggro, 2 Gruul Aggro, 2 Red Deck Wins (it didn’t), and one Jeskai Control. 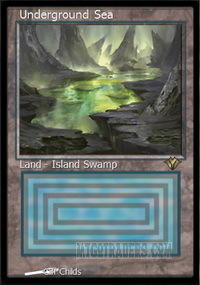 Modern: SCG had a Modern Classic last weekend. 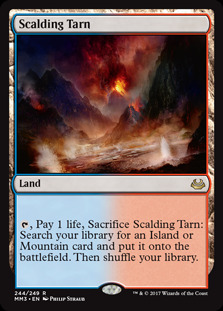 The top two decks were – once again – Izzet Phoenix. 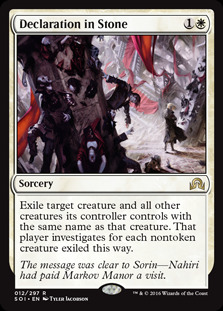 I’ll say it again: unless the Modern format Mythic Championship shows us a completely new metagame, I would expect to see bannings next time around. 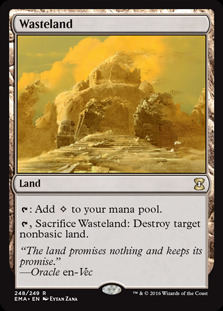 Even now, with the format trying to adjust (note the maindeck Declaration in Stone ), not much has changed. Legacy: SCG held a Legacy Open in Cincinnati last weekend. The Top 8 had a nice mix of archetypes, with the only repeat offender being the season-appropriate Death and Taxes. Standard Staples: Standard prices are making a few adjustments this week. These fluctuations are what we have seen for years. The big price crash following Arena’s introduction seems to be over. We are seeing gradual price changes as the metagame evolves. Plus, we have a new set waiting in the wings. 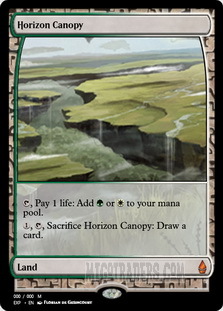 Eternal staples: Prices for cards in the eternal formats are continuing to climb. 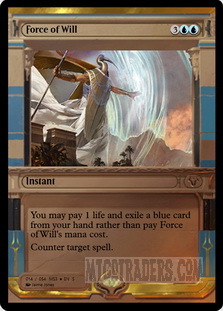 Force of Will is climbing back up. I don’t think it can reach its previous highs – over $100 per copy – but it could. 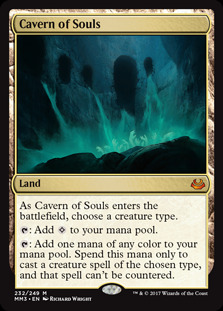 It depends a lot on whether Wizards gives us another chance to play Masters Editions or Eternal Masters as real cards. 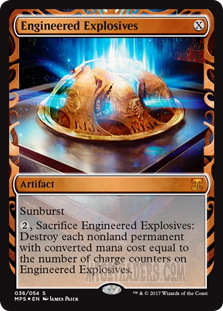 Or puts FoW into Treasure Chests at higher frequencies. The big number is the retail price of a playset (4 copies) of every card available on MTGO. 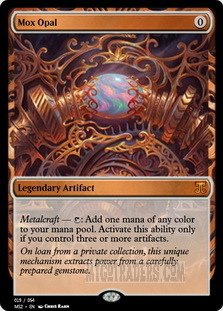 Assuming you bought the least expensive versions available, the cost of owning a playset of every card on MTGO is approximately $ 13,660. That’s up about $265 from last week. Climbing week by week all this month. It’s planting time. I should spend the weekend in the garden and cleaning up the yard. However, the forecast is for rain. Yay! I should be able to spend a large part of the weekend watching coverage of the Mythic Invitational and playing online. 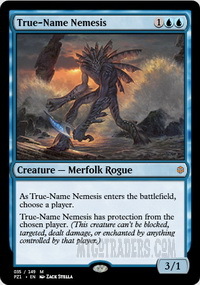 Probably MTGO, but maybe a mix.